Tesla is now delivering Model S's at a rate roughly 25,000 per year, well above the 20,000 per year production goal, and in total Model S owners have driven over 12 million electric miles. What happens when a start-up automaker exceeds the production rate goal they've published over and over? Tesla Motors has promised that in 2013 they'd produce 20,000 Tesla Model S's, or about 400 cars a week. However, in their latest Inside Tesla blog post George Blankenship claimed the factory had reached a 500 car/week production rate, and was looking to push the rate even higher. What Blankenship wrote is: "During the past three weeks we have averaged more than 500 Model S deliveries per week, and it looks like we’ll be setting another record this week." That production rate equates to about 25,000 Model S's per year, which is quite a bit more than the 20,000 cars per year production goal. However a careful reading of Blankenship's statement shows that the delivery rate is 500 cars per week, which may not mean they've achieved that as the production rate. It may mean there was a backlog of deliveries which is being sorted out, perhaps by hiring more delivery specialists. The 20,000 Model S per year production target was stated during the June 2012 Shareholders meeting, and has been reiterated several times since. Such as, in Tesla's Fiscal Year 2012 SEC filing. 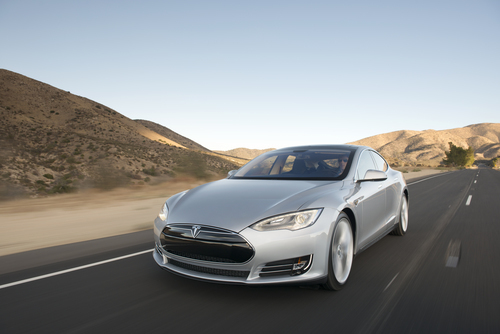 Unlike other automakers, Tesla Motors does not publish monthly production or sales numbers. These numbers are published (summarized really) in the quarterly SEC filings, instead, making those filings critical documents for predicting Tesla's chance of making it to profitability. In the latest filing for Fiscal Year 2012, Tesla management promised they'd reach profitability this quarter, thanks to the increased sales rate. Several times since the June 2012 Shareholders meeting, Tesla Management claimed they needed sales of only 8000-10,000 Model S's per year to break even ("cash flow positive"). Now that the production is at, or above, 20,000 per year the promise of being profitable in the first quarter of 2013 (ending March 31) seems plausible. What we'll be watching for is a hint of whether Tesla will be able to maintain the sales rate over the long term. In other words are there more than 20,000 Model S customers in the world? Curiously, a Facebook posting by Tesla Motors, posted the same day (March 21 2013), said "We've ramped up! The Tesla factory is now producing 400 Model S a week!" The Fiscal Year 2012 SEC filing said that production rate had been achieved in December making it a real puzzle why they'd post a Facebook message three months later to celebrate reaching that production level. If Tesla did not actually reach that production level in December 2012, but only just now did so, their actual sales will be much lower than expected. Lower than expected sales means lower than expected revenue, endangering the promise of reaching profitability this quarter. If they reached that production level then failed to maintain that production level, does that mean trouble in Tesla's manufacturing plant or supply chain? Additionally Blankenship disclosed that as of March 21, 2013, the 3000th Model S has been registered in California. This number is important not just to demonstrate how eagerly Californians are buying electric cars, but because Tesla earns ZEV credits on every electric car they sell. The company sells these credits to other car companies, so that those companies can continue to sell cars in California even without selling their own ZEV's in that state. The Inside Tesla blog post also had a few other little tidbits: They're now conducting test drives in Europe and Asia. In total Model S owners have driven 12 million miles since the first Model S delivery last summer. They're promising some progress in building out the Supercharger network, whose deployment is not progressing as rapidly as expected when launched last fall. Specific areas mentioned are Pacific Northwest, Texas, Illinois, and Florida with additional coverage in the Northeast and California. The major automakers would all exceed their goals as well if they never had to provide any real figures. Ford delivers, on average, about 10,000 F Series pickups a week with a paper trail to prove it...while Tesla's numbers could be nothing more than a figure of Musk's imagination. Until this company simply releases its sales figures each month as all other US automakers do they are just using auto writers as part of their marketing and financing effort. As far as I can tell this company has not once met any sales goal it promised. Lots of innuendo, lots of hints from Mr. Blankenship. Never a spreadsheet. My guess is they have delivered about 4K or 5K Model S total cars to customers and taken money for them. That in itself is an amazing, and positive number. Not sure why they have to keep alluding to more sales. Since all we have to go on is the about 2650 they admitted in February to selling to customers, my guess is as good as anyone's. Had Tesla actually sold 400 per week as of the date of its last SEC filing it would surely have been the headline of its press release. Hopefully I'm wrong, but if Tesla is cashing 400 checks per week why have they not announced they are, and that they have turned the corner? "if Tesla is cashing 400 checks per week why have they not announced they are?" They have announced that and the line from the latest Tesla update blog where they do is directly quoted in the article above. "During the past three weeks we have averaged more than 500 Model S deliveries per week" The fact that they haven't met sales goals is only proof of the fact that they are setting themselves ambitious targets, the obsession with Tesla failing by a few writers here is getting old, they are doing something that only a handful of completely new car companies have managed to do in the last century and you can count on one hand the number that were wholly US owned and made. They are rolling out an award winning car and are doing so within a few months of their sales targets which in the end are goals not set in stone but targets to aim for. I see your point. Do you see mine? Mine is that this quote only means that 1500 Teslas were delivered. The Sub-title implies that Tesla is on track to deliver more than 25,000 cars this year, which I hope is completely true. Delivering 1500 cars in 3 weeks does not add up to a run rate of 25,000 cars in 2013. If Tesla had delivered 400 cars per week, and cashed 400 checks per week until the blog post last week it could say that the company had delivered 4800 cars to customers since Jan 1st and all doubt would be removed - as long as the next two SEC filings matched that. I take no issue with the story, it is well written. What I am complaining about here is that Tesla is being too cute by half with its production announcements. Just FYI, setting bold production targets and then missing them when you are private is fine. When you are a public company, and you are using taxpayer dollars as financing, and you set production and profitability goals and you miss them - it is not in any way fine. If you then imply you had been meeting your goals, when you had not been, it would seem that is misleading investors. How is Tesla going to survive? Their gross profit percentage is 8%. They are only delivering 6,500 cars a quarter. Tesla lost $90 Million in the last quarter alone. If the average price on a Tesla S is $75,000, which is high according to Tesla, then that would only mean a gross profit of $30 Million so Tesla would have a net loss of between $50-60 Million for this quarter. Musk said Tesla would be profitable. I have a bridge in Phoenix I would like to sell you too. I know there are a lot of people who drink Tesla KoolAid. I have been to the Tesla Showroom three times and driven one and think it is a great car. But, this just proves once again Obama picked another loser and investors are investing with their hearts but not their business brains.